Channel Drainage is used to collect and drain water from paved areas, often at the edge of paths and driveways and in front of garages, doorways and industrial units. 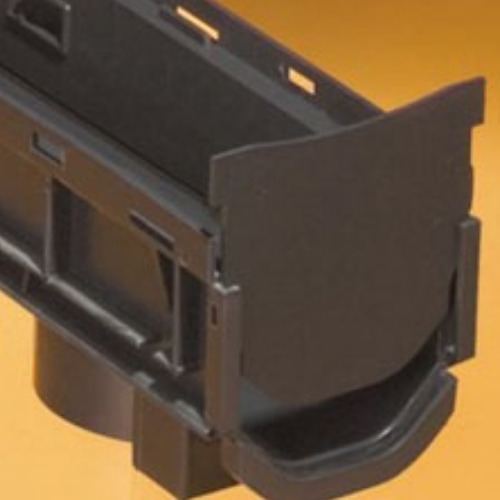 Our domestic channel drainage is manufactured by FloPlast and is commonly used on domestic properties. Domestic channel drainage is usually discharged into the same outflow as the rainwater pipe system from the house, either a soakaway or surface water drain. Our commercial channel drainage is manufactured in strong polymer concrete by ClarkDrain. A wide range is available including sump boxes and filters. All of Our 110mm and 160mm pipes and the majority of our fittings are manufactured from PVC-U. Inspection Chambers, adjustable bends, gully traps and grids are manufactured from polypropylene. Pipes and fittings are manufactured in Golden Brown. They are designed for use in gravity drainage, sewerage and storm water installations at depths of up to 10 metres. You can learn much more about these products in our Guides & Tips section. Our land drain is a very efficient, single wall, corrugated and perforated pipe used underground for collecting excess rainwater from boggy areas such as gardens and playing fields. The water filters into the land drain via the perforations and is then run off to a suitable dispersal point such as soakaway, watercourse or a surface water drain. It works very well when used in conjunction with our soakaway system. For those who wish to collect and re-distribute their rainwater, we sell rainwater harvesting systems designed in accordance with BS8515:2009 to the highest standards. In our range of flexible Ducting, Professional Building Supplies stocks coils of Black, Blue, Orange, Purple, Geen and Yellow Duct, in addition to our rigid twinwall duct system. We also stock 54mm and 90mm BT Duct for cabling purposes and electric polyduct. We also stock a range of manhole covers in steel, plastic, cast and ductile iron. For further information please take a look at our manhole cover section which contains a wide range of technical information to ensure you find the correct cover for your particular application.